Oklahoma City Thunder's Russell Westbrook gets into a heated verbal altercation with fans in the first half of an NBA basketball game against the Utah Jazz, Monday, March 11, 2019, in Salt Lake City. The Utah Jazz said the fan displayed 'excessive and derogatory verbal abuse' directed at Russell Westbrook. The Utah Jazz announced Tuesday it has permanently banned a fan who was involved in a heated verbal altercation with Oklahoma City Thunder's Russell Westbrook during Monday's game. 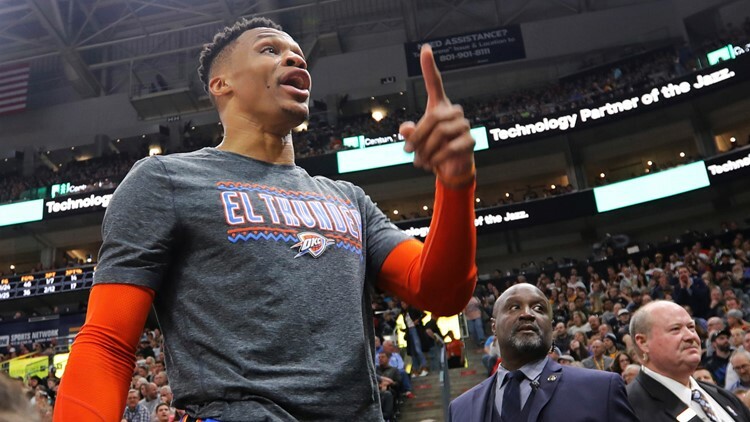 The team said it reviewed video evidence and eyewitness accounts and determined the fan violated the NBA Code of Conduct with "excessive and derogatory verbal abuse" directed at Westbrook. "The Utah Jazz will not tolerate fans who act inappropriately. There is no place in our game for personal attacks or disrespect," the statement said. Video from the incident during Monday night's game in Salt Lake City caught Westbrook threatening the fan and hurling expletives at him. Westbrook later explained his response was triggered by comments the fan made that he considered "racial" and inappropriate." After the game, he told reporters the fan told him "to get down on my knees like you used to." The fan, identified as Shane Keisel, spoke to a local reporter after the game and disputed Westbrook's claim. The Utah Jazz statement said the ban is effective immediately and includes all arena events, not just NBA games. According to Utah Jazz reporter Eric Woodyard, Westbrook was fined $25,000 for the verbal altercation.